Pennsylvania is a proper noun. Pennsylvania is (1) a university in Philadelphia, Pennsylvania, (2) a Mid-Atlantic state; one of the original 13 colonies, (3) one of the British colonies that formed the United States. The following articles provide more information about the proper noun Pennsylvania. Learn about rural, suburban, and urban real estate markets in Pennsylvania. Real estate agents, buyers, and sellers will appreciate the Pennsylvania real estate resources on this page. Pennsylvania state history, geography, and travel information are the subjects of this Pennsylvania atlas page. This National Park directory page lists National Parks, Historic Landmarks, and Natural Landmarks in the State of Pennsylvania. An interactive Pennsylvania map, plus photos and highlights, are included thereon. Harrisburg is Pennsylvania's state capital city. 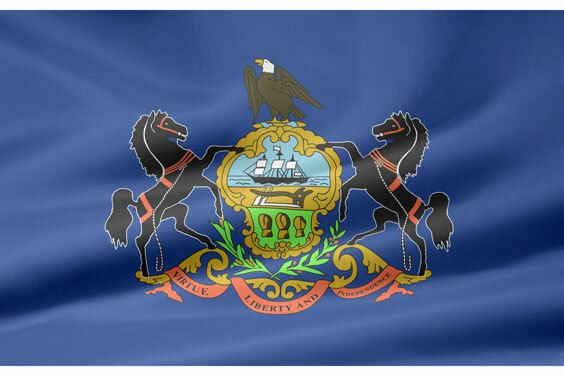 Learn about Pennsylvania state government operations and services. Browse the Pennsylvania travel and tourism information, and read about living and working in the Keystone State. This official web site for the City of Philadelphia has convenient information about city departments and operations. Learn about the services offered to residents, visitors, and businesses in Philadelphia, Pennsylvania. Penn State, founded in 1855, is located in State College, Pennsylvania. It is the State-related, land-grant University with 24 campuses. The main campus has almost 37,000 undergraduates and 6300 graduate students. The school participates in The Big Ten Conference and NCAA Division 1-A for most sports. This is the website for the Pittsburgh Post-Gazette. The site contains breaking news, international and local news, weather, neighborhoods, sports, living, opinions, obituaries, classifieds and everything else that is contained in the printed newspaper. There are also links to places where viewers can send in news stories and post photographs. Philadelphia is the largest city in the Commonwealth of Pennsylvania, the second largest city on the East Coast of the USA, and the fifth-most-populous city in the USA. The Philadelphia Convention & Visitors Bureau (PHLCVB) is the official Tourism Promotion Agency for the City of Philadelphia globally and the primary sales and marketing agency for the Pennsylvania Convention Center. The state of Delaware is the 49th largest state, bounded by Pennsylvania and New Jersey to the north, Maryland to the south, and the Delaware Bay and Atlantic Ocean to the east. Website produced and maintained by the University of Pennsylvania. Includes 25,000 significant, full-text, free titles. These are titles that no longer come under the standard copyright rules. Published by the editors of the Philadelphia Inquirer and the Philadelphia Daily News, this online portal features editorial and advertising content that is intended for a Philadelphia, Pennsylvania audience. Sections include News, Sports, Entertainment, Business, Food, Lifestyle, Health, and Marketplace. The following articles provide recent Pennsylvania-related news. Marc Levy. Washington Times. Sunday, 21 Apr 2019 10:04:24 -0400. Reuters. Friday, 19 Apr 2019 23:17:22 -0400. Alexander Burns and Shane Goldmacher. New York Times. Friday, 19 Apr 2019 20:19:28 GMT. ABC News. Friday, 19 Apr 2019 15:04:26 -0400. President Donald Trump's proposed cuts to a number of programs supporting people with disabilities is "not only unjust but also fiscally foolish," according to former GOP Pennsylvania Gov. Tom Ridge. Newsmax. Wednesday, 17 Apr 2019 20:08:47 EDT. CNBC. Tuesday, 16 Apr 2019 14:23 GMT. Yahoo. Friday, 12 Apr 2019 07:17:21 -0400. Zacks Equity Research. Zacks. Wednesday, 10 Apr 2019 13:14:00 GMT. The following digital image illustrates the proper noun Pennsylvania.